The romantic feeling I got when we moved into this cute old house flew out one of its seventeen windows once the outside temp dropped below 40. It's cold! Still, I feel like I should be doing more. There has got to be a way to make better use of the heat we're pumping into this place. Cover drafty windows with plastic. This stuff really works so I can't wait to get it up. 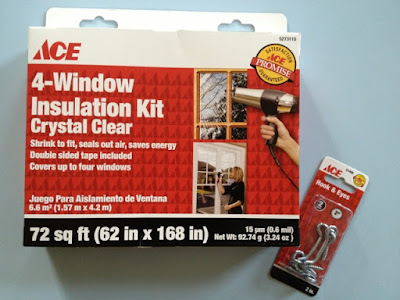 Last winter, I cleaned a small apartment while the handyman covered the two windows with plastic and instantly it got at least 10 degrees warmer! Check out this video on how to use a window insulation kit to weatherize windows (via the Green Dream Group). It's so drafty downstairs near the entranceway to our apartment. If this works, I'm pretty sure we'll save a million dollars. Hello retirement! Again, the Green Dream Group has a how to video for this. Love these guys! If you don’t use certain rooms, keep the vents in these rooms and doors to these rooms closed. Our attic isn't insulated. Since we don't own our house and I'm not sure how long we'll even live in Providence much less this apartment, insulating it isn't going to happen-- at least not on our end. Instead, I'm putting a hook and eye on the doors of our laundry and guest room so all the warm air doesn't fly up there. Use an electric blanket or mattress pads. This wasn't on Jasper's list, but I think mattress pads and electric blankets are brilliant. 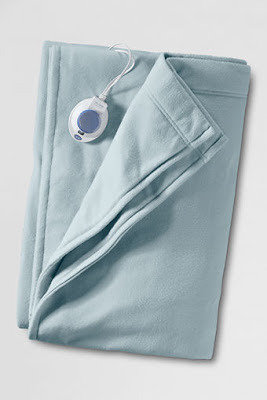 According to the Lands' End website, their electric blanket allows you to turn down the thermostat 10-15% while you sleep and save up to 10% a year on energy and heating bills. They say the same savings can result from their mattress pad. I've had the pleasure of enjoying these things during sleepovers and oh my god... I hope Santa brings me a heated mattress pad this year! These things aren't cheap but Lands' End usually has good sales. Right now, use promo code JOLLY and pin 1112 to save 40% on a single item and get free shipping. No, they're not paying me to write this, but they should. LOL! I can totally relate, Olivia! My apt that you've been to in BK is draft central in the winter, everything from huge 10' tall windows to the wood panels beneath the windows. Thanks for all the extra tips - and the reminder to do it before it gets freezing. Stay warm! Hugs! Yay! Glad this was helpful! Huggles!